The 2002 vintage of Chenin Blanc from Stellenbosch property Post House, which was famously judged best in category at the 2003 Fairbairn Capital Trophy Wine Show (later to become the Old Mutual Trophy Wine Show), is still drinking beautifully. 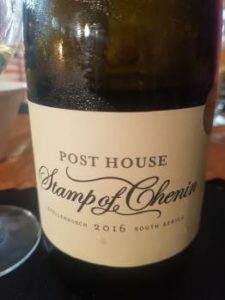 Owner and winemaker Nick Gebers opened a bottle last night at a function to celebrate the opening of his expanded cellar – Gebers set up shop in a disused post office back at Raithby in the Helderberg back in 1997 and now makes some 16 000 cases a year. Also on show was the recently bottled 2016 vintage of the Chenin called “Stamp of Chenin” (all the wines bearing philatelic names). It’s looking smart, the nose showing a floral top note before yellow peach and apricot, bee’s wax and a hint of spice, the palate rich and thick textured offset by tangy acidity with a little bitterness on the finish to add interest. Better resolved than the 2015 (see here). Price: R150 a bottle.